In an effort to be accepted, we often fall victim to peer pressure. Though we frequently preach this to our children, peer pressure is not limited to the younger generation. By nature, humans want to be accepted by those around them. This desire often leads us to do things that we know are wrong. As Christians, we are repeatedly convicted to either do something or not to do something. Yet, in weak moments, we follow the crowd instead of following the leadership of the Holy Spirit of God. Generally, the crowd is wrong. Rarely is this principle ever untrue. The majority of the world is wrong in their approach to life. The majority of the religious world is wrong in their approach to God. The majority of Christendom, even, is wrong on their approach to doctrine. As previously stated, the majority is usually wrong. This is not an absolute truth. But, it is a general principle that can normally be counted on. 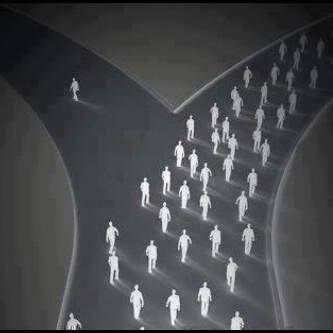 Following the crowd will usually lead you to do things you will regret. Many young people have lost their purity by following the leadership of the crowd. Yet, this is definitely not limited to young people. Many young people abuse alcohol in an attempt to impress their lost friends. Yet again, this is not limited to young people. Many young people use vulgar language in hopes that they will be looked at as “cool” to those around them. But once again, this is certainly not limited to young people. Many young people see things from a liberal, humanistic worldview in an attempt to be accepted by the crowd. Once more, this is not limited to young people. The crowd almost always leads us to do things that are contrary to God and His Word. To an unbeliever, he is easily swayed as he only has a worldly perspective. Yet, even believers struggle with the desire to be accepted. The Bible condemns fornication while the world glorifies it. The Bible condemns drunkenness while the world seems to live for it. The Bible warns against using corrupt words while the world thrives on it. The Bible says God is right and every man is a liar while the world rebels against God. Friends young and old, it’s difficult to live in this world today. The pressures associated with this life are real and we often fall victim to them. But, that is no excuse. We must not put ourselves into compromising situations. We must constantly be on guard against the devil and his wiles. We must always seek to glorify God in all that we do. With that attitude, all will fall in line. Won’t you pray just now that God will give you strength to fight the good fight of faith until this life is over?